WASHINGTON – On Wednesday morning, when George H.W. Bush’s casket is carried into the Washington National Cathedral, it will be set atop the same black-shrouded bier on which Abraham Lincoln and almost a dozen other presidents were once posthumously laid. Like Dwight D. Eisenhower, Gerald Ford and Ronald Reagan, Bush will then be honored in the house of worship he himself saw completed as president 28 years ago. And like his predecessors, Bush is expected to receive tributes from all the living presidents, including his own son, George W, Bush, and President Donald Trump. The state funeral will be steeped in tradition, but there will also be a few personal touches to remind mourners that the nation’s 41st president was also his own man. Bush will be wearing socks adorned with planes flying in formation, a nod to his service in World War II, when he was shot down while flying a torpedo bomber in the western Pacific. After he is flown back to Houston on Wednesday afternoon, he will be transported in a special “Bush 4141” train to College Station, before being driven to his presidential library, where he will be buried. And unlike Reagan, Bush will not travel in a ceremonial horse-drawn wagon, called a caisson, according to spokesman Jim McGrath. “As with his boating, skydiving, golf and just about everything else, speed was his focus for this necessary series of events,” McGrath said. “There are some traditions but it’s up to the president if they want to tinker with it,” said Matthew Costello from the White House Historical Association. Costello said that most presidents begin planning their funerals shortly after moving into the White House. One exception, Costello said, was John F. Kennedy, who was assassinated before he had drawn up plans for his own funeral. Jacqueline Kennedy decided that his services would be modeled after Lincoln’s. 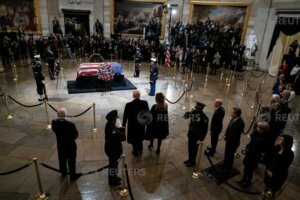 “The first lady wanted his funeral to follow Lincoln’s very closely, because obviously they were presidents who suffered a similar fate,” Costello said. Part of her plan involved placing Kennedy’s casket atop Lincoln’s catafalque – the bier, or frame, of rough pine boards nailed together hastily after Lincoln’s own assassination nearly a century earlier – while he lay in state. In doing so, Jacqueline Kennedy created her own tradition. The previous two presidents to pass away, Calvin Coolidge and Franklin D. Roosevelt, had not used Lincoln’s catafalque. (The word comes from the Italian catafalco, or scaffolding, according to Slate.) In fact, only four of the 17 presidents to die since Lincoln had used it. Since Kennedy, however, six of eight presidents have been laid on the catafalque, including Bush. Harry S. Truman, who was renowned for his humility, did not want to lie in state. Nor did Richard Nixon, who eschewed many of the post-presidency traditions after he was forced to vacate amid scandal. The black-shrouded box has also borne other dignitaries, including Supreme Court justices and legislators, the last of which was John McCain. When Reagan passed away in 2004, he was carried from the Ellipse to the capitol on a caisson. A riderless horse followed the carriage, with Reagan’s own riding boots in its stirrups, facing backward to symbolize it was his final journey. Like Ford, who died in December of 2006, Bush opted for a hearse. Costello, from the White House Historical Association, said the differences in presidential funerals remind us of the uniqueness of each president. And the fact that American presidents are not all buried in the same place – as are the leaders of some other countries – but rather at their homes or, increasingly, at their libraries, is important. On Wednesday afternoon, Bush’s journey to his own burial place will begin. From Washington National Cathedral he will be taken to Joint Base Andrews in Maryland before being flown to Houston, where he will be taken by motorcade to St. Martin’s Episcopal Church, where he and his wife regularly worshiped, for a public viewing. On Thursday morning, after a private funeral at the church, Bush’s casket will be taken to a train station and loaded into a Plexiglas-lined car pulled by the locomotive named after him. The Bush 4141 is a Union Pacific train painted white and blue to resemble Air Force, complete with a presidential seal. When the train was unveiled in 2005, Bush himself took it for a spin. “President Bush said, ‘Can I take this for a drive? '” recalled retired Union Pacific general director Mike Iden. The former Navy pilot then drove his namesake train for about two miles. This time, Bush will be in for a longer journey, traveling the 70 miles to College Station in two and a half hours, according to the Joint Task Force National Capital Region. The train will pass through four town – Spring, Pinehurst, Magnolia and Navasota – on the way. At the train station in College Station, Bush will be welcomed by Texas A&M’s official marching band playing the “Aggie War Hymn.” He will then be taken by hearse to his presidential library, which is located on campus. One last ride for the man who liked to go fast, whether it was parachuting out of airplanes until he was 90 or playing golf at breakneck pace, even when partnered with Tiger Woods. Like previous presidents, he will then receive a flyover from 21 fighter planes, one of which will peel away before flying over the library. The “missing man maneuver” will be particularly poignant for Bush, who only narrowly escaped his bomber after it was hit by Japanese ground fire during an attack on Sept. 2, 1944. His two crewmen were killed. It will be a pilot’s tribute to a pilot president. Bush’s casket will then be carried by pallbearers to his grave, next to his wife Barbara, who died in April after 73 years of marriage, and their daughter Pauline Robinson “Robin” Bush, who died of leukemia when she was three years old in 1953. In a private ceremony, the flag draped atop his coffin with the blue field over his left shoulder – a custom dating to the Napoleonic Wars – will be folded and handed to his surviving daughter, Dorothy Bush Koch. Then the speedy president will finally come to rest.